Air travel presents a unique environment that can cause stress to passengers. Most people don't have any problems when they fly, but it's possible to make airplane travel safer and more comfortable. Luggage falling from overhead lockers is a common cause of mid-air pain, with injuries ranging from cuts and bruises to severe head trauma. Breathing contaminated air can cause drowsiness, headaches, respiratory problems or neurological illnesses. Pain, bleeding and even a ruptured eardrum can happen to passengers experiencing changes in air pressure during flight. An increased risk of deep vein thrombosis (DVT) in air travellers has been widely noticed, especially in the legs. If the clot dislodges and travels to the lungs it can cause a potentially fatal condition called pulmonary embolism with the clot risk growing with the length of the trip. Passengers on long-haul flights are at greater risk of getting blood clots or DVT. However, DVT can be an issue for travellers on other types of long journeys, not just air travellers. In fact, anyone who remains relatively inactive may increase their risk. Jet lag is a sleep disorder that occurs in individuals who have quickly travelled across multiple time zones. • Try not to travel if you have a cold, flu, or sinus infection. The cabin pressure will make the symptoms worse. 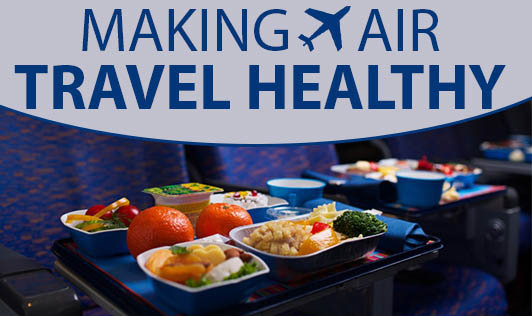 • The air in airplanes is dry, so drink non-alcoholic, decaffeinated beverages and water to avoid becoming dehydrated. • Walk every now and then during your flight. While seated move your toes, ankles, lower legs, hands, wrists, neck and shoulder to avoid stiffness and improve blood circulation. • Get plenty of sleep before you leave. • Eat well-balanced meals. Avoid overeating. • Make sure the luggage is stowed well - either overhead or under the seat. • Use a pillow or lumbar support to prevent back problems.